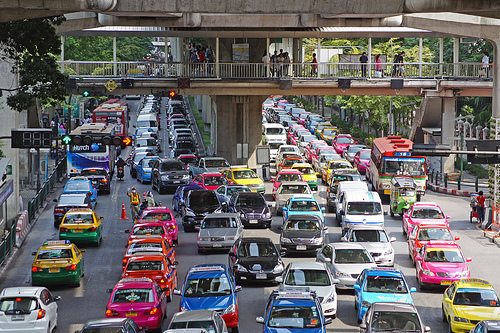 Bangkok traffic is colorful but nasty. Planners hope the BRT - which opened its first route on May 30 - will ease congestion in the city. Image via UweBKK (α 550 on ). Bangkok’s BRT opened at the beginning of June, and is running on a free-trial basis until August 31 to try to encourage bus-riding to ease the city’s grinding gridlock. The new BRT in Thailand’s capital – a city of nearly 10 million people – has 12 stops covering about 15 kilometers, with an average distance of about 1 kilometer from station to station. The first trunk route runs from the chichi (and smoggy) Sathorn Road to Ratchaphruek Road. 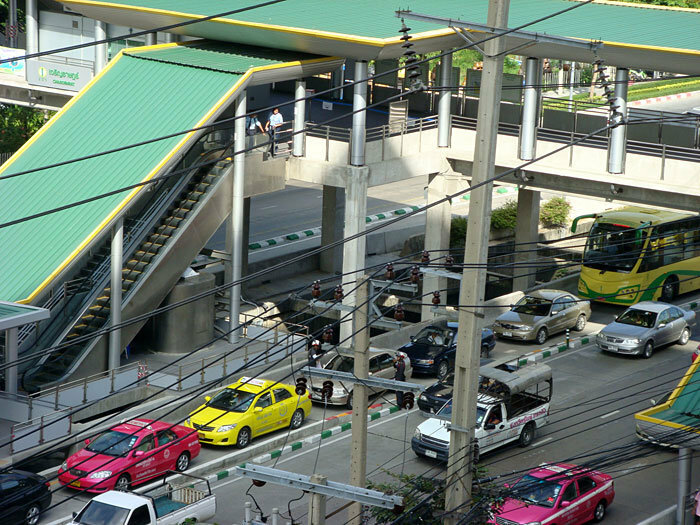 So it doesn’t get great marks (yet) for improving connectivity and accessibility for the city’s poorest neighborhoods; still, Bangkok Metropolitan Administration (BMA) says four new routes will be added by 2012. Barrow also created a useful Google Map showing the BRT route and interesting spots along the way. So far there are 25 BRTBangkok buses, with a capacity for 80 passengers each. Photo via Richard Barrow, MyThailandBlog.com. Looks like a tight squeeze for this BRT bus trying to make a U-turn at terminal station BRT-Sathorn. Photo via Richard Barrow, MyThailandBlog.com. Signage is fairly good, however: monitors in stations and waiting areas say the expected arrival time of the next bus in English and Thai (again, so far there’s no audio announcement for the visually-impaired). 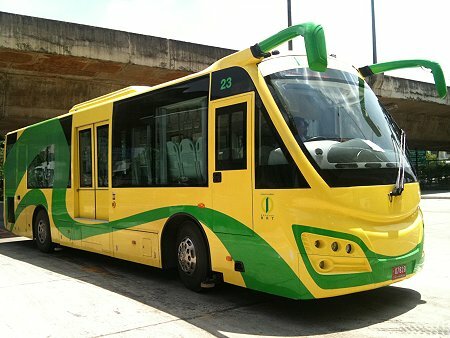 The BangkokBRT branding seems effective: the bright yellow and green buses, with their antenna-like green mirrors, call people’s attention – and they’re air-conditioned! Stations are not wheelchair-accessible. At this ticket station, an escalator leads down to the waiting room/platform. Photo via Richard Barrow, MyThailandBlog.com. 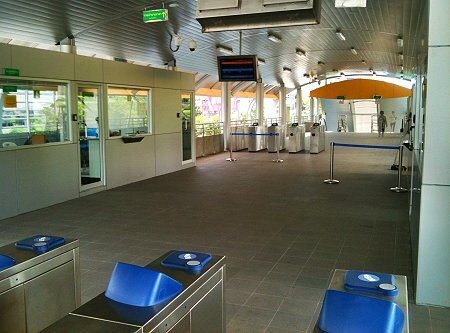 Monitors in the ticket area and waiting area show the next bus's expected arrival time in English and Thai. Photo via Richard Barrow, MyThailandBlog.com. Bangkok needs to block other traffic from BRT lanes to ensure that BRT succeeds in boosting public transit ridership and easing congestion. 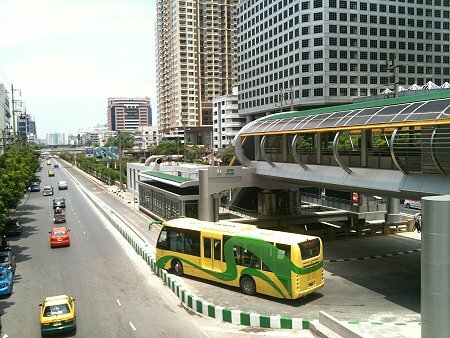 Here, BangkokBRT shown stuck in traffic. Photo via "Goddess" on Skyscrapercity.com. 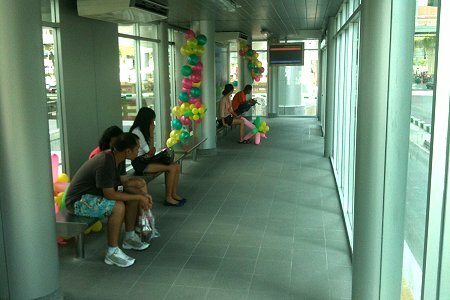 For Richard Barrow’s full report on the first day of BRT operations, look here.